Thai Cookery School, Birmingham U.K.
Thai food is filling but not bloating. It's healthy and nutritious and can easily be adapted for vegetarians, people on low-salt diets or those keeping halal or kosher. Every Thai meal must balance five fundamental flavours—hot (spicy), sour, sweet, salty and bitter. Thai dishes use a wide variety of leaves rarely found in the West, such as lime leaves It is frequently combined with fresh coriander, garlic, galangal, lemon grass and turmeric blended together with liberal amounts of various chillies to make curry paste. Holy basil (which is a Thai variety rather than anything religious!) is also used to add fragrance in certain dishes such as Green curry. Other typical ingredients include the small green Thai eggplants, tamarind, palm and coconut sugars, lime juice, and coconut milk. 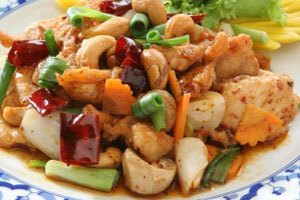 A variety of chilies and spicy elements are found in most Thai dishes. Rice is an integral part of the meal. In fact, in Thai, our word for "eat" is "eat rice" showing just how central it is. Low in fat and cholesterol, Thai food is a great health option because we emphasise fresh ingredients rather than tinned or frozen foods. As it normally uses no dairy or wheat products, it's great for those on special diets. A 2001 report for Health Which? 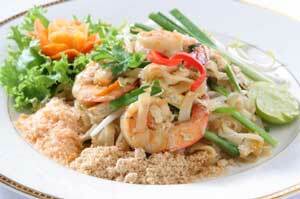 found that most Thai dishes are healthy, as many are based on steamed rice and vegetables, fish, lemon and garlic. 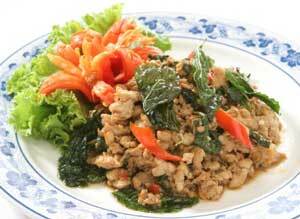 Read more about Thai food. Most people want to learn to cook the popular Thai dishes listed below, but you're the boss—I can easily tailor the course if there's a dish you've eaten somewhere that you want to learn. This course is new for winter 2010–2011. Why not treat someone for Christmas? There's a discount for booking the whole course. Contact me for more information. 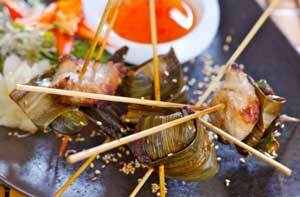 Your first lesson will introduce you to the flavours of Thai cooking and its essential ingredients. You'll learn how to cook rice properly, and to get started, you'll learn how to cook a popular mild Thai dish, chicken with cashew nuts (pictured) and pad pak ruammit (stir-fried mixed vegetables). We Thais love soups. They aren't reserved as starters, but come with the other main course dishes, and are spooned over rice and eaten. You'll learn the sour, lemony soup tom yam and the rich, coconut-based tom kha (pictured below), using fish, seafood or the meat of your choosing. 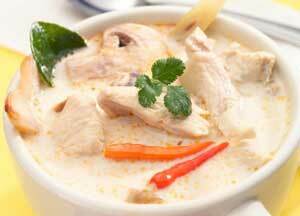 Thai curries are very different from Indian curries. There's green curry, with its spicy sauce and peppery baby eggplants. 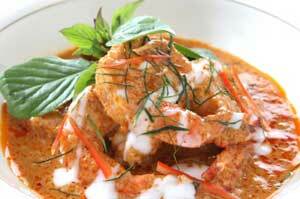 There's coconut-based red curry (below) which is excellent with duck or pork. There's geng ga-rii gai, a mild yellow curry, rich paneng curry, and mussaman curry, which was originally cooked by Thailand's muslims using that exotic vegetable, the potato (well, it's exotic for Thailand!). Thai salads are nothing like European ones; the term generally refers simply to dishes whose only cooked ingredients is the meat or seafood. 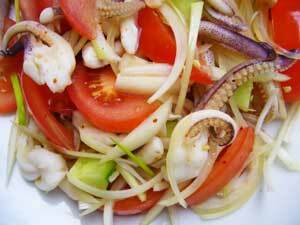 Generally, a significant part of the salad is chilli, so you can expect them to be pretty spicy. You'll learn spicy beef or squid salad (pictured below), or the somtam, the legendarily spicy raw papaya salad from Isaan, the North-east of Thailand (subject to the availability of the ingredients, and your bravery). These are the quick and nutritious meals that you grab for a snack or a lunchtime meal on the go. They're common in cafés near offices and schools. Sample dishes are beef in oyster sauce, pad krapow (meat and vegetables stir-fried with Holy basil - pictured below), egg-fried rice and gai pad khing (chicken fried with ginger). These are dishes that take a little extra preparation, so they look as great as they taste. We cook them to wow guests at dinner parties—you'll want to do the same. plaa manow: a whole fish cooked under a mound of lime, garlic and chilli. It looks spectacular on the plate and is tasty but surprisingly not very spicy. The very nicest (but expensive) way to prepare this dish is to use monkfish; the thick flesh aborbs the flavours absolutely perfectly. spring rolls: you know what these are! There's an advanced course, too, which can be taken as a follow-up to the usual course. I teach those foods which are common in Thailand but are very rare in British "Thai" restaurants, such as "khao soi" which we eat in North Thailand, and delicacies from Isaan (the area on the Thai-Laos border) like namtok moo, laab and gai yang. We don't do cow placenta soup, though. Updated March 2015. © Thai Cookery School. All rights reserved. Thai cooking lessons in your own home.